Good morning everyone. Cooler temperatures have found their way here and although it isn't cold it's definitely better than the high 80's we were having. Fall was far from my mind this year as most of you know. 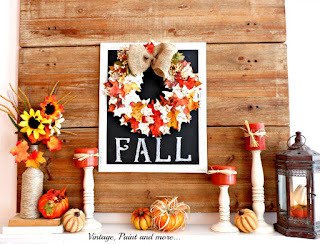 However, I love Fall so much I had to incorporate it into our home. So simplicity was my main goal. 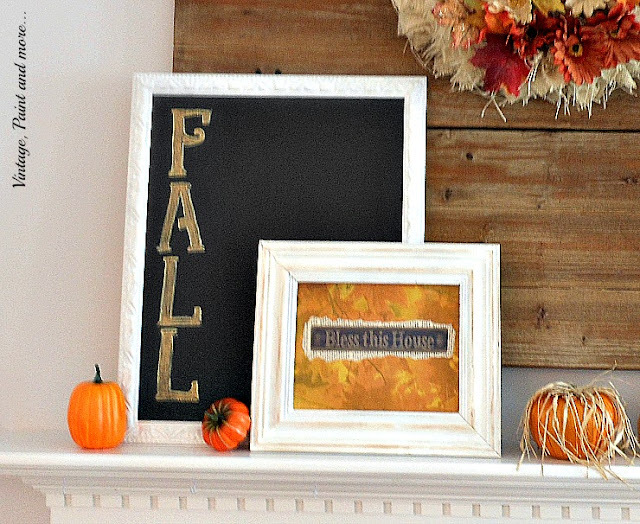 Today I am going to share our 2015 Fall Mantel with you. As I said above - simplicity was my goal this year so I used things I already had on hand but in new and simpler ways. I love the bright colors of Fall - all the oranges and golds and burgundies just make me smile. Therefore those colors are what I decided to use. I also love to use different textures to give lots of depth and interest to my vignettes. Such as this one over the fireplace. I started with our resident wood plank wall hanging that does such a beautiful job of showcasing all the various wreaths I love to make. This Fall I decided to use our burlap wreath I made but I added a few "faux" Fall flowers that I found at the dollar store. This brings so much color and texture into this area. On the left side of the mantel is an old chalk board I made from a thrifted picture frame that I wrote F-A-L-L on with orange chalk and outlined with yellow chalk. Next to it is a framed print I made this year from scrapbook supplies and a bit of burlap I had on hand. The frame is one I picked up at a thrift store then painted and distressed a bit. I then added a few "faux" pumpkins of various textures. The right side of the mantel has a vintage pitcher filled with "faux" wheat stems. I set the pitcher on a stand of old books sans covers and tied with raffia. The box to the right is a box that held a candle my son bought me. I thought the box was just too pretty to throw out and the colors were a perfect fit for this display. I added a small pumpkin on top. A few more "faux" pumpkins with various textures finished out this side. That's it for this years Fall mantel - I love it. 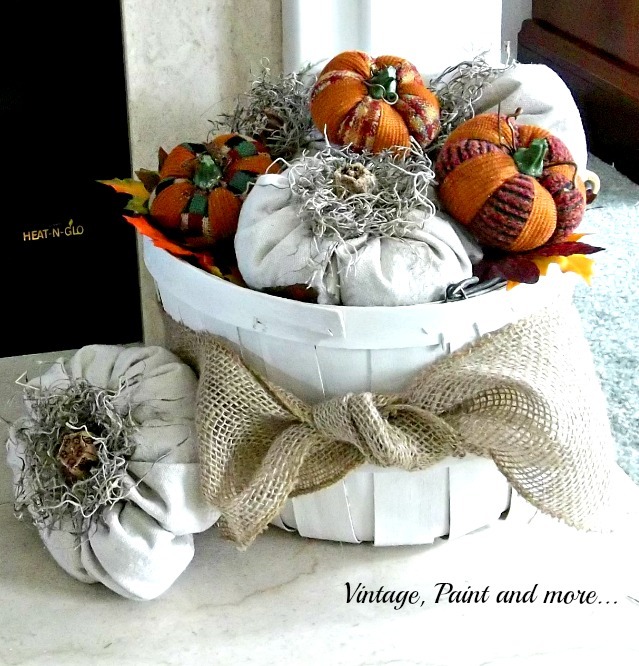 Simplicity, color, and texture - the three elements I love for Fall decorating. And I already had everything except for the small "Bless this House" print so it was easy on the budget also. It's all about using what I have in a new way. 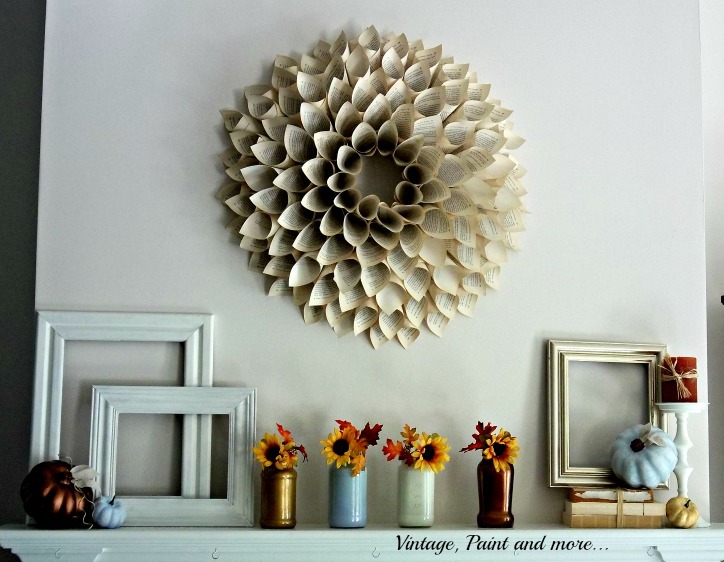 That's what I love about decorating - making the old new again. What have you used in a different way with your decor this Fall? I love to hear from you so tell me about it in the comments below. I will be linking up to the parties listed on the Where I Party page. 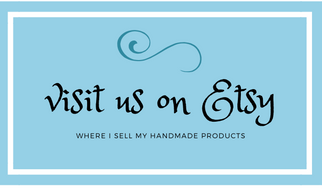 Please be sure to visit and check out all the wonderful inspiration and creativeness you will find there. Wow, this came out REALLY cute! Very pretty, Cathy! Your mantles of years' past are equally as lovely! It looks great! I have been wanting more simplicity too. It just feels so much better! Simplicity is our theme this year and I am enjoying it so much. Thanks for stopping by. This is beautiful! I am loving the rustic look to this one! You have had some amazing mantels in the past! What a beautiful rag wreath Cathy! Your mantle looks great! And I love that you only used things you already had. Thank you for sharing! Thank you Cat. I love finding new ways to use what I have on hand. That wood plank is great, and your Fall vignette looks perfect in front of it! Thank you Julie. I love the texture this plank adds to our mantel. I also like you mantel and the way you have balanced it with creative items. Love the tones in the wood plank as well! Happy Autumn! Your mantle turned out great, I really like it, very festive and fun and a very nice vignette. This is so cute and perfect for fall! Beautiful! I love the idea of using what you have on hand. 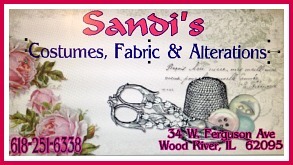 Found you on Silver Pennies Sundays Link party. I like your mantel. It's so simple and pretty. Love the white pitcher with the wheat. 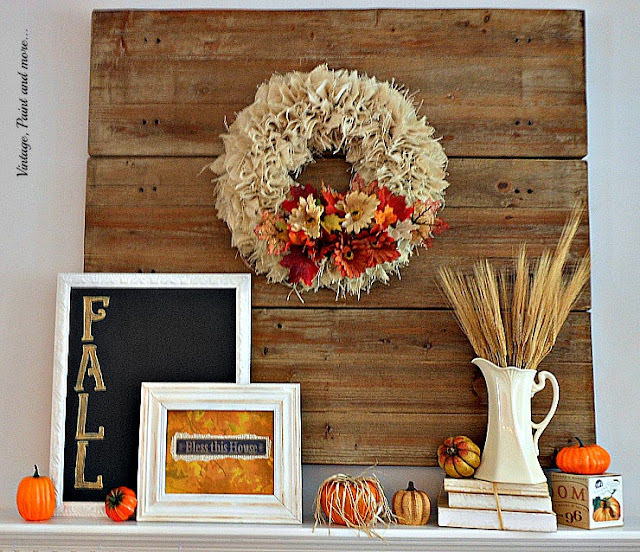 So happy you are sharing your beautiful fall decor you made on your mantel. Lovely mantle, Cathy--your burlap wreath against the plank wall looks stunning. I like your use of wheat stems, too. Thanks so much for linking this post up with Vintage Charm! It all looks so lovely, Cathy. 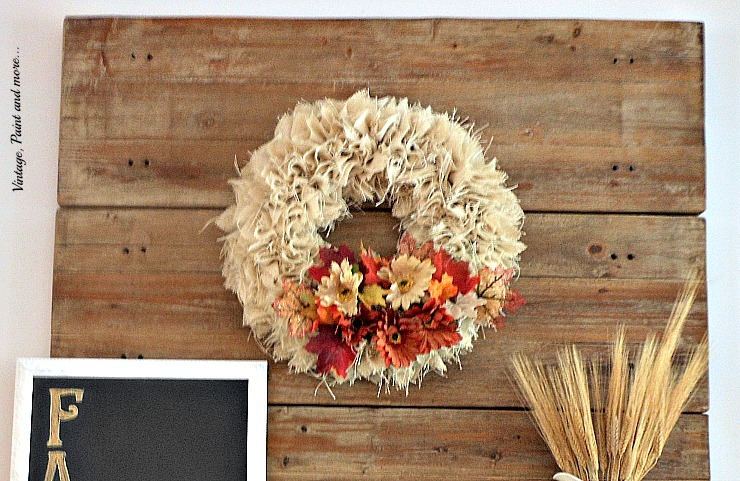 The wreath and the wheat are perfect fall touches. Thanks for sharing at Snickerdoodle Sunday. 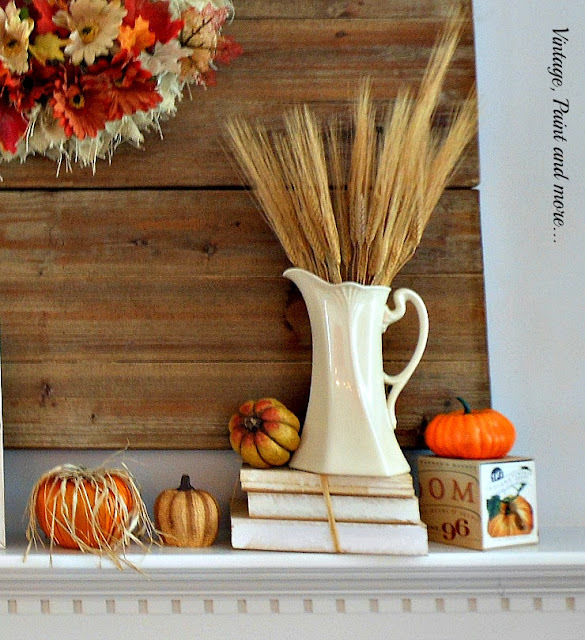 I love your simple approach to this mantel, SO well done! Thanks for sharing with us at Pin-Worthy Wednesday-look for your feature tomorrow! It's a beautiful little vignette Cathy. We just finally had a "cool" day in the 70's and I'm finally feeling more inspired for Fall. Thanks for sharing at The Creative Circle. 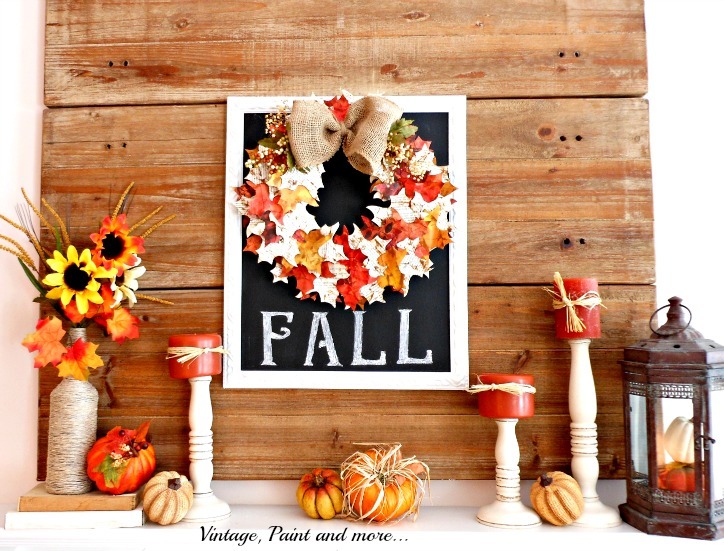 I love your fall mantel! So pretty!